It’s almost the beginning of fall so of course we have to have a Fall Giveaway! Who is ready for fall? I definitely am! The light breeze, sweaters and boots, apples, apple cider, apple pie, leaves changing colors. What’s not to love?! The Fall Giveaway is live! Link in profile. This Fall Giveaway is only open to the United States (except Hawaii and Alaska) addresses, and ends 9/23/2017 at 12:00 am Eastern US time. Your email address is the only mandatory entry, and is not added to email lists (I hate when that happens too). The prize will be given to one lucky winner. To enter use the form below. Good luck, y’all! ? The best part about fall is all the color changes provided by mother nature. It is truly inspiring. I love the cooler weather for my morning walks. My Fall favorite is walks, enjoying nature. The colors of the leaves, mums in bloom, and pumpkins! Fall is my favorite time of the year. I have more decorations for this season than any others. I love everything fall! The leaves changing, weather cooling down, Apple cider, donuts, pumpkin patch. It’s the best!!!! I love the leaves, crisp air and pumpkin everything! fall is lovely! the colour of the trees, leaves everywhere and hot chocolate! I love the beautiful fall colors of the trees, and the cooler weather. I love to take walks when the leaves are falling, and the air is cool. I’m excited for fall, see ya later summer! Wow, my phone stinks at spell check, lol. Fall colors and bonfires. My favorite thing about fall is the colors. I like the change in temperature. The air turns cool and crisp. I start thinking of all the comfort foods we enjoy this time of year. I look forward to cooler temps! I HATE summer (I live in west-central LA, and it gets HOT!) and LOVE fall and winter! My favorite part of fall is watching the leaves change colors. So beautiful! I love the colors of fall and pumpkin everything!! Its cooler in the morning so I can wear my boots; as long as I’m home before noon when the temp rises. My favorite thing about fall is that there are no more spiders. I love the colors of the changing leaves and the smell of the brisk fall air! Having lots of homemade soup, crocheting by the wood stove, watching snow fall on the trees. Crunchy fall leaves underfoot while walking the dogs. I love fall. This is my month with the leaves turning and the cooler weather. Plus my birthdayou, not to mention Halloween.. I love fall colors so much. Love this time of the year and the fall colors. What I love most about fall is the chill in the air, the gorgeous, warm colors, apple cider, pumpkins, and getting away with wearing just a sweater!!! I absolutely love the colorful leaves on the trees!!! Pumpkin pie is definitely a close second. ? I live in Florida and we don’t have much of a fall, but I love the days when there is a certain feeling in the air and just a bit of a coolness in the breeze. When the sky is a deep cloudless blue and the cypress trees are changing colors and losing their leaves. I love the leaves changing colours, hot/cold apple cider near the bonfire!!!!! Your patterns are easy to follow and the hats are adorable! After living in the desert for the last 22 years, the changing of the season from summer to fall and all that goes with it!!! I am excited I love fall and these colors are beautiful ! I love hot apple cider and roasted marshmallows but most of all family around a fire. my favorite part of fall is apple picking and pumpkin carving. My favorite things about fall are the colors and the sweaters! I love Thanksgiving! Unfortunately, here in So Cal the only fall colors come from decorations!! I love the trees changing colors. I live in the Great Smokey Mountains and the colors are amazing!! Love the smell in the air and warm fires on chilly nights. I love the colors of fall. Being able to curl up under my blankets and crochet. I love all of the fall colors and the wonderful comfort food of the season. Fall is my favorite season! I love everything about it. I love the smell and feel of the air. There is just something about it. The changing colors, The cooler days. And of course PUMPKIN EVERYTHING! 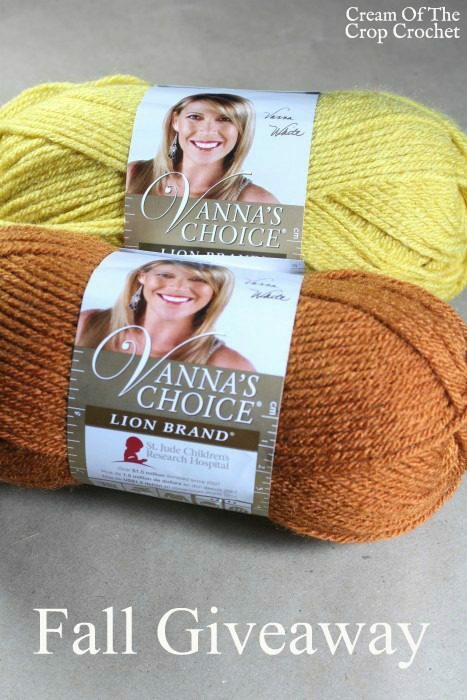 Love all things fall, vanna’s chctce is one of my favorite yarns, love the colors!!! I love the cooler temps and sweaters/sweatshirts! My favorite thing about fall is the weather! I love being able to wear hoodies again! And to be snuggled under blankets ? Fall is my perfect season for reading outside and napping under trees. It’s when I love to just look around at the Tennessee foliage and find my inspiration to write my poetry. It’s when friends get together for bonfires, marshmallows, scary stories, and good times. Fall is just my little slice of heaven for a few months out of each year. I live in Michigan and we have 4 great seasons here, but Fall is my favorite! The weather is perfect, the bite in the evening air is great sleeping weather, the colors are fantastic, and I love Fall fashions! Sweaters, cowls, jackets, scarves, leather…love love love! Love going to pumpkin patch! Being able to wear sweaters and sweatshirts is one of my favorite things about Fall! I like that the weather is cooler and the leaves change colors. Really like these fall colors. Fall leave colors,temperatures,apple picking,fire pits,and Halloween are just some of the best parts of autumn. Relax and crochet some cozy items with some earthy colors! Welcome to Autumn! So in love with everything fall! The cooler weather, the changing leaves and all of the fun that comes with harvest season. Finally! Cool weather so I can crochet easier. Love the colors to inspire me. So wonderful to see a young lady of 20 carrying on the tradition of crochet. I am inspired and it makes me hopeful for the future that this art will not be forgotten. Love your work and your site. Blessings to you! I love these colors! They would make a beautiful scarf and hat set or a nice, soft baby sweater for my ONLY baby girl! ? Can’t wait for the leaves to change and to enjoy the cool, crisp air. Thank you for this giveaway!!!! ? Fall is my favorite time of the year… I love the leaves, and crocheting while watching football, and warm apple cider. Just the best time of the year! Would love to make the fall leaves pattern. I love to walk in the park and smell the fresh scents of fall. Also, I like pumpkin spice! I love fall! My favorite time of year. I’m so excited for Fall! The colors, the smells, the food…I love it! Love the smell of fall!!! I like crunching through the fallen leaves! Love the color combination. It makes me think of the leaves changing. We take long drives looking at the changing leaves. The Changing season. Going from summer to the fall, hot to cool weather. Love Fall! Ready for the crisp nights and cool days. My favorite season is Fall! Such a riot of colors! I Love to Crochet. I would Love to be able to win the yarn. I am disabled and keep practice with my hands. To make bed cover. It’s just beautiful. I can’t stand up long and don’t go shopping. I am really not crazy about the fall. I am a spring person because I love working in the garden. Fall is just cleaning up and putting my flower pots away for winter. The yard looks so bare. Sorry! I love the colors, the air, and temps during fall! It’s my favorite time of the year. Lovely time to be spending outdoors. Very pretty colors; perfect for fall. I am so ready for fall. My birthday is in November, so I love fall! My favorite part of fall is the cool crisp air and the leaves changing colors! Such a beautiful season!! What isn’t fabulous about fall, the crisp air, the pretty trees, hot chocolate, kids football games, etc. I love the cooler temperatures of Fall, but also hot cocoa, fall leaves, squash ripening, colors! Leaves changing colors & sweater/sweatshirt weather! Fall favorites: red, yellow and orange leaves, crunchy leaves, crisp air, yummy apples, snuggly sweaters and cozy scarfs!! Cool mornings, warm afternoons, cool evenings…and the colors! ?? The fall colors and cooler weather. My favorite thing about autumn is pumpkin everything!! What I like most about “Fall”? The cooling temperatures and the changing colors. Love the colors and cooler temps…. Fall brings cooler temperatures and the changing colors of the trees. Love the Fall colors and the cooler weather. My favorite part of the fall is the leaves changing colors it looks like an amber forest. I love the different colors. My favorite things about fall are the changing of leaves, cooler weather, and pumpkin spice everything! My fave thing about fall is the sound of leaves crunching when I go for a walk! My favorite things about the fall are cooler temperatures after our very hot summers, pretty leaves changing colors, rain, pumpkin pie, sweaters, and not needing to run the air conditioner anymore. 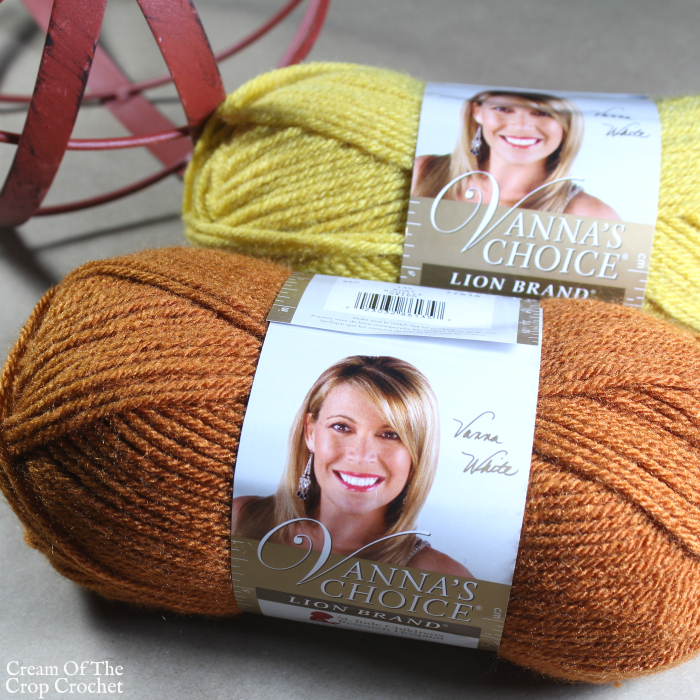 The warm and rich colors of this yarn is perfect for Fall! Being a fall birthday gal – I love the season, especially Halloween. This Fall Giveaway looks great! Thanks! Love the colors…. from the clouds coming over the mountains to the leaves changing. Beautiful!! I love fall colors and being able to enjoy cool mornings on the back porch! I love the smells and colors of Fall. I love the cooler temps, gorgeous colors, scarves, sweaters, and boots! I love the cooler weather and wearing sweaters. 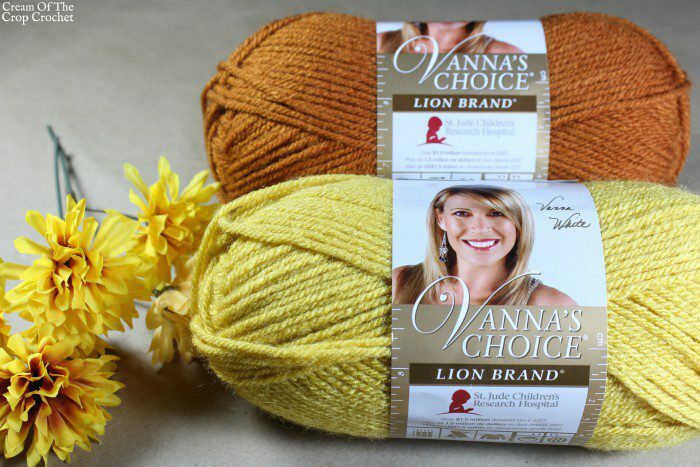 Vanna’s Choice yarn is my favorite yarn to crochet with. The colors, apple pie, and Mums! I love the colors of the fall leaves. Thank you for the awesome giveaways!! Loving the colors ?? I think the colors are my favorite thing about Fall. I love the changing of the leaves colors!! And being able to sit on my front porch and not get eaten by mosquitoes!! I love watching the weather changestation in fall. I love apples, pumpkin and the changing of the leaves. I love the fall colors and the cool temperatures. I love Fall… This season suits me perfectly…. I’m born in october, 10th…. I’m 63 very soon….n I’m crochet addict…. I think the thing I love the most about fall is sitting by the fire when it gets cold out. I love the cooler weather and the colors of the leaves changing on all the trees! I love those colors I could make a big beautiful blanket with that .I’d love to win .. I love the cooler weather. Wearing sweaters and boots, and the leaves changing colors.